Today's nail polish was first on Instagram and now on the blog for once. 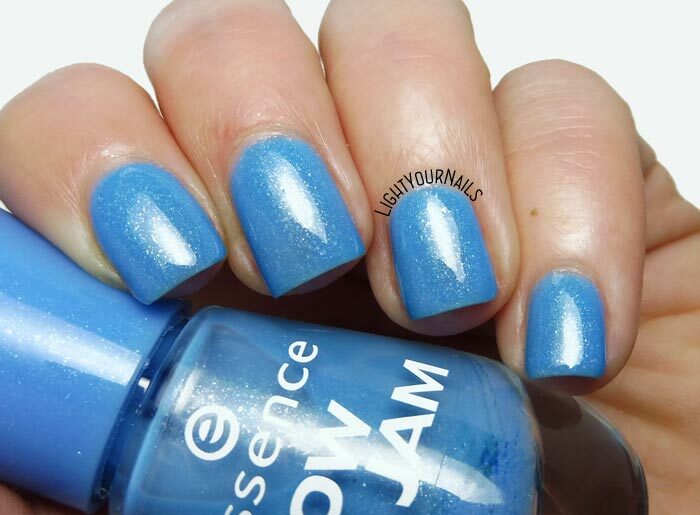 It's quite an old Essence nail polish from a past limited edition called Snow Jam. It's hard to find for sure, sorry! I decided to pick it up to join The Nail Polish Hoarder's Pantone 2018 Spring Summer challenge on Instagram. Unfortunately I missed the first couple of colours and I guess I'll do them in the end, or here and there. Last week's colour was PANTONE 16-4132: Little Boy Blue. I looked into my collection and I thought Essence Goofy Blue could be a good match. 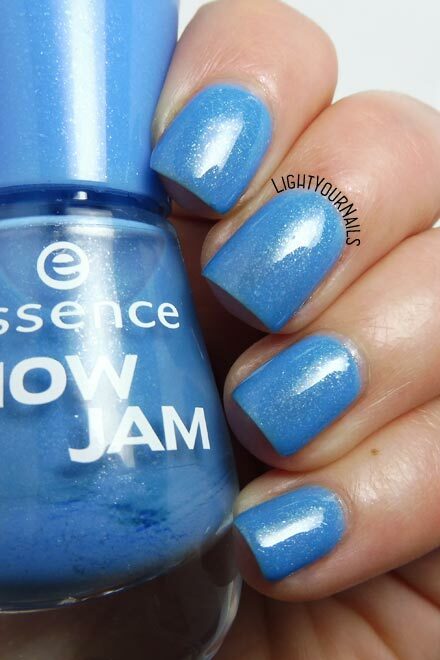 Essence Goofy Blue is a glassflecked light blue, very easy to apply and perfectly opaque in two coats. It doesn't dry very glossy so you'd better use a top coat to add some shine. Drying time is reasonably quick. Removal is similar to a glitter unfortunately, those flecks don't want to go away! 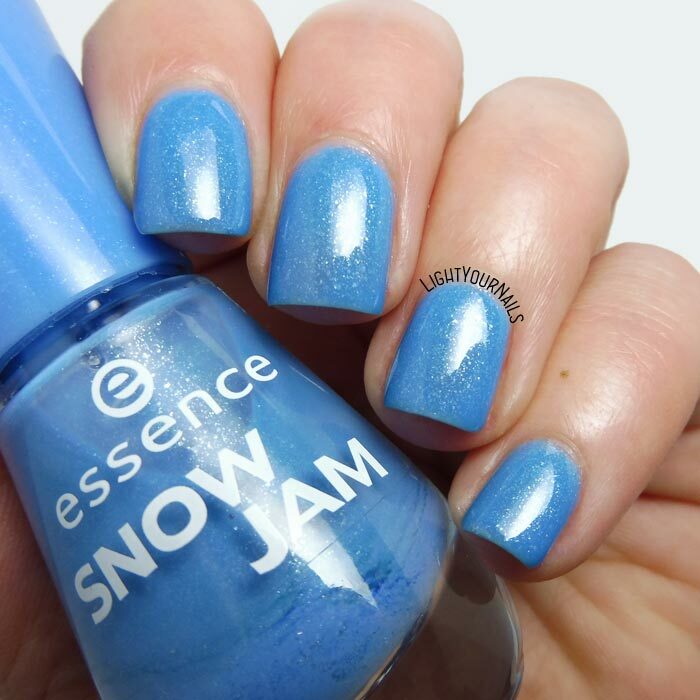 I think it's a lovely winter shade, exactly what Essence meant it to be. Not very sure it's a Spring colour as Pantone choose?! When I think of an Easter/Spring blue I'm all about something more pastel and creamy. What about your opinion? Here below you can find the link to The Nail Polish Hoarder's post about the challenge, maybe you can jump on board, too, and do the missing colours in the end like me? It's been snowing for 3 straight days over here and this ugly weather totally calls for a dark mani. 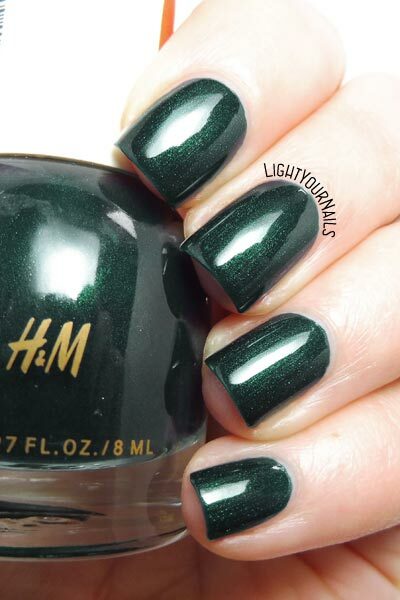 I'm wearing H&M Scarab which is a dark forest green with a shimmer finish. Application is super easy and you get perfect coverage in two coats. I was surprised by how quickly it dries and it's very glossy, too. I was afraid it could be a stainer but I can happily tell you it's not! I only have some green hints around my cuticles but my nails are perfectly clean after removal. 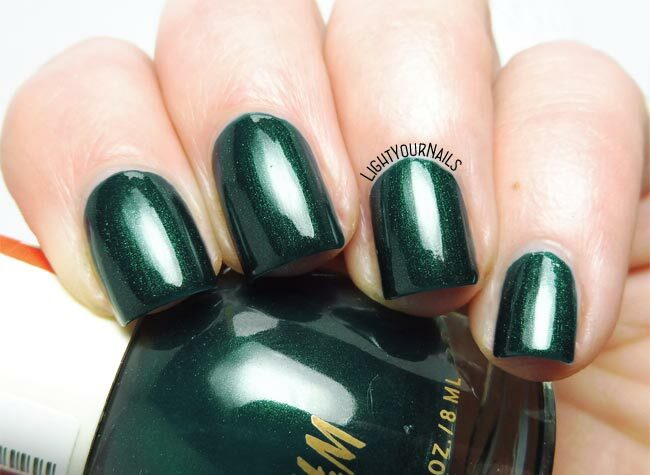 It's a standard shimmery dark forest green if you ask me. I hoped it had major depth which is not the case. Anyway I got some compliments for it so it must be me having higher standards or different taste! Formula is pretty good so if you own nothing like it it's a good purchase for sure. I just have too much nail polish haha. Do you like green nails? Dark or light? Today it's time for letter D of the Untried A-Z Challenge hosted by Lustrous Lacquer. 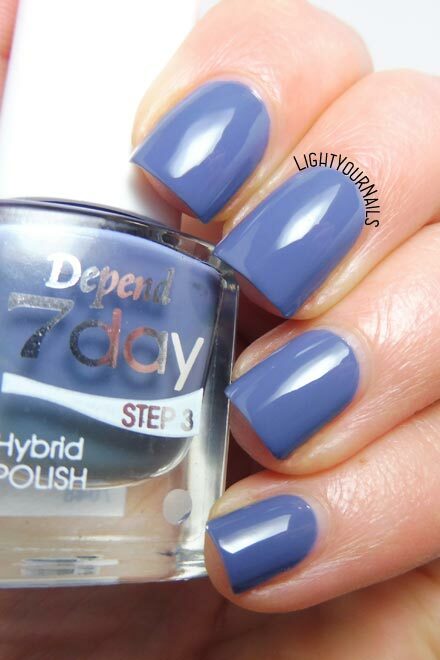 I picked a lovely dusty blue by Swedish brand Depend. Depend 7 day no. 7048 In Harmony* applies evenly although it's quite sheer at first coat. It reaches full coverage at second coat anyway, which really surprised me. Drying time is a bit on the slow side so I helped myself with a little fan and top coat. The finish is extremely glossy and the final mani looks like a gel one. I am very pleased with this nail polish. It's a shame I can't find it any longer in shops, and it was very expensive anyway for such a small bottle. Have you ever heard about Depend brand? Do you like today's shade? Forse vi sarete accorti che gli ultimi articoli del blog sono scritti solo in inglese. Se mi seguite da un qualsiasi lettore di notizie non avrete notato il link che appare adesso su ogni post, che rimanda alla nuovissima versione solo italiana di Light Your Nails! Avere le due lingue insieme mi sembrava troppo caotico e non mi soddisfaceva più. Ho quindi fatto la scelta di dividere il blog in due lingue distinte: questo rimarrà solo in inglese, mentre se volete leggere i miei articoli in italiano adesso potete farlo su it.lightyournails.com. Ovviamente spero che continuerete a seguirmi dove più preferite! I've already mentioned Italian salon brand TNS Cosmetics Firenze lots of times on the blog and you know I love it by now. They recently released their Spring-Summer 2018 collection called Bon Ton. I've already posted swatches of TNS Capri which is one of the shades from this collection and today I have another one. 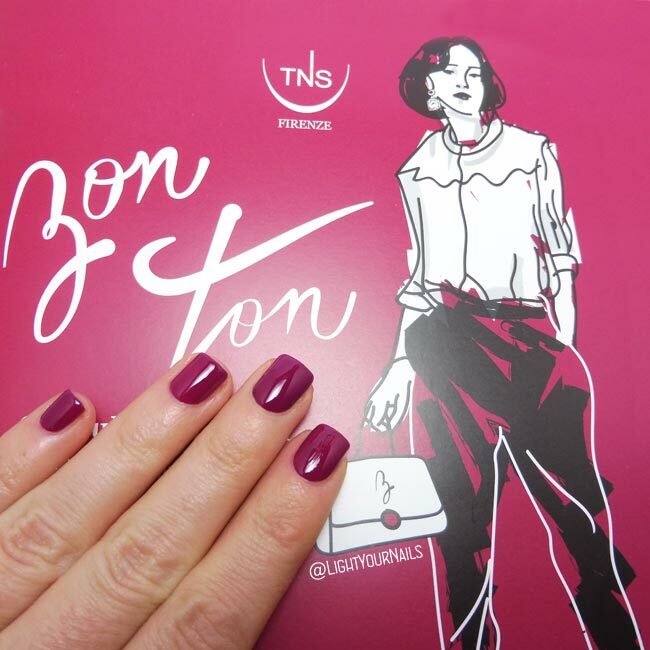 TNS Bon Ton is the shade the collection is named after and although TNS calls it a bright pink I think it's a raspberry purple instead. As of this collection TNS nail polish formula is 7 free and I can totally feel the difference. While we had very opaque nail varnishes before, we now have a more watery/jelly consistency. Bon Ton definitely leans to a jelly formula, and you need 3 coats for a better and more opaque coverage. However drying time is quick so I didn't really mind. The finish is very glossy. TNS shades are always so chic and elegant, I adore this brand. Would you agree with the brand about this shade being a pink or with me seeing it purple? 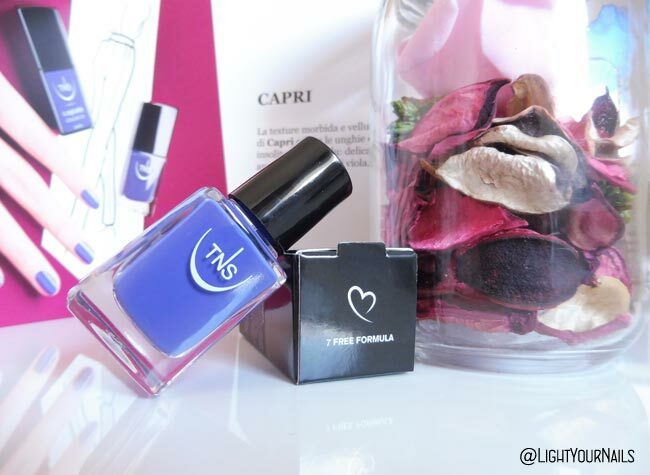 Today I am showing you an Italian nail polish by salon brand TNS Firenze. TNS Capri (no. 535) was released as part of Bon Ton Spring-Summer 2018 collection, which is available both as nail polish and gel (soak off). They describe it as a blue shade but I think it's actually a blurple, or an indigo if you prefer. It's that perfect transition colour between blue and purple. The formula is different from all other TNS nail polishes I own and I think it's due to the new 7-free formula. Application is easy anyway and coverage is perfect in two coats. It dries quick and to a very glossy finish. 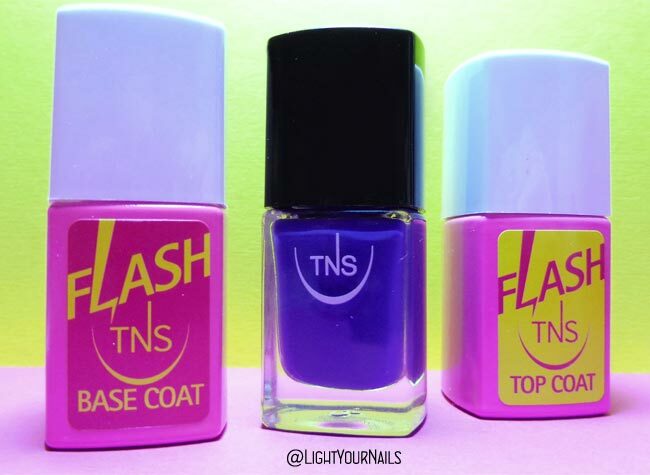 When I added TNS Flash top coat I could see no difference in terms of shine. Top coat is more for lasting time this time. This shade goes so well with denim or white trousers, gotta love it! Just out of curiosity, would you call it blue or purple? Oggi vi presento la nuova collezione Primavera/Estate 2018 firmata TNS Firenze: Bon Ton. "La nuova Capsule Collection di TNS Firenze sceglie uno stile essenziale, unico e sofisticato, decisamente Bon Ton." "Una collezione esclusiva, dedicata a una donna iper femminile, sempre elegante, mai sopra le righe e attenta ai dettagli di stile: rouches, pantaloni morbidi e ballerine, borsa - piccola e comoda, elegantissima - e una parure per accendere di luce il viso. Cinque nuove nuance, smalti che riprendono toni, colori e dettagli di stile che hanno fatto la storia della moda. Ideali per il giorno e per la sera, dal rosa intenso all’azzurro, dal rosso al viola, saranno i must have di stagione in attesa dell’estate. Una linea di smalti e semipermanenti dai colori ultra chic!" "Le preziosità delle rouches, l’eleganza assoluta dei pantaloni capri, l’essenzialità senza tempo delle ballerine, l’indispensabile capriccio di un bijoux e di una piccola borsa bon ton. Rosa scuro, azzurro, viola, rosso intenso e rosso acceso, da indossare sulle unghie come un nuovo, preziosissimo accessorio in versione tradizionale o semipermanente, e solo nei migliori Centri Estetici." L’eleganza e la ricchezza delle Rouches incontrano il viola, un accento di eleganza assoluta. Ideale per la sera, ancora più suggestivo se arricchito da un tocco di top coat. Texture morbide come di velluto, linee decise e nette: i pantaloni che hanno reso famosa la movida italiana degli anni Sessanta sono l’ispirazione per Capri, un blu iperpigmentato e - è il caso di dirlo - decisamente chic! È il rosso per eccellenza, pieno, profondo, sensuale. Un’intensa nuance, elegante e sofisticata assolutamente senza stagioni. Il secondo rosso in collezione si accende di luce e abbandona le tinte scure della sensualità per una nuance totally glamour. Come dei preziosi bijoux illumina la vostra manicure di un nuovo, raffinato accento di vanità. Bon Ton, il tono che dà nome alla collezione, è un rosa acceso, elegantissimo e iperpigmentato. Da scegliere per qualsiasi occasione e per ogni momento della giornata, da indossare solo se si decide di non passare inosservati. 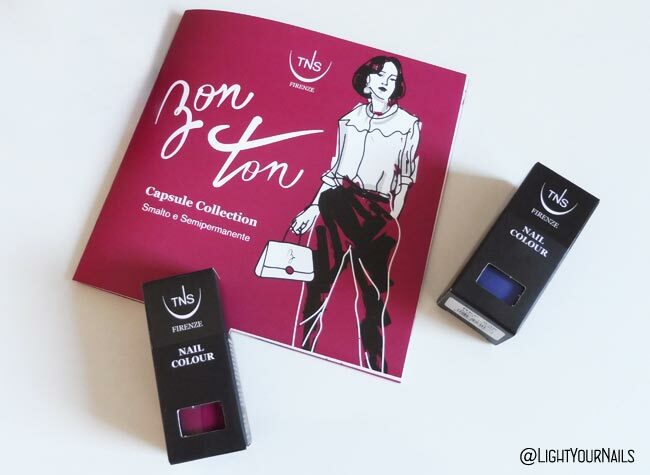 "Bon Ton è la nuova capsule collection firmata TNS Firenze, marchio italiano della azienda Tecniwork S.p.A., leader da oltre 30 anni nel settore manicure e pedicure professionale. TNS Firenze concentra il suo impegno nello sviluppo e formulazione di prodotti e trattamenti sicuri e all’avanguardia per la cura e la bellezza di mani e unghie con la creazione di cosmetici per la manicure professionale a cui affianca una produzione esclusiva di make-up in capsule collection ed edizioni limitate. Utilizzati da professionisti, i prodotti TNS Firenze sono studiati per essere altamente performanti ed efficaci e garantire il miglior risultato possibile. I prodotti TNS Firenze sono disponibili nei Saloni e Centri Estetici distributori del marchio. Per trovare quello più vicino visitate il sito internet tnscosmetics.it o la pagina Facebook e consultate lo store locator dedicato." Avete notato dalle foto che gli smalti TNS adesso sono 7-free? Ancora più sicuri per le unghie, è una bellissima notizia. Ovviamente nei prossimi giorni vi parlerò nel dettaglio dei due smalti in mio possesso, Capri e Bon Ton. Intanto ditemi cosa pensate di questa collezione: vi piacciono l'ispirazione e i colori? As you might know I joined Lustrous Lacquer and some other bloggers for the A to Z Untried challenge. We'll post one untried nail polish every other week till the end of the year going our way from A to Z. I have so many untrieds needing some love, this is a great way to get them out of the dust. 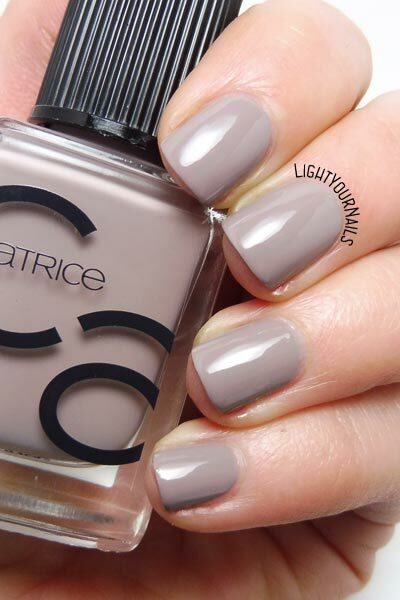 For letter C I picked Catrice ICONails no. 27 Lana del Grey, a taupe coloured creme nail polish. Application is easy despite the formula being on the thick side. Coverage is pretty good and the finish is glossy. Drying time is slow so you'd better use a good top coat. It's a pretty polish, not my favourite though. I have two taupe cremes that I adore, one by Kiko and one by China Glaze, and nothing compares to them for me. 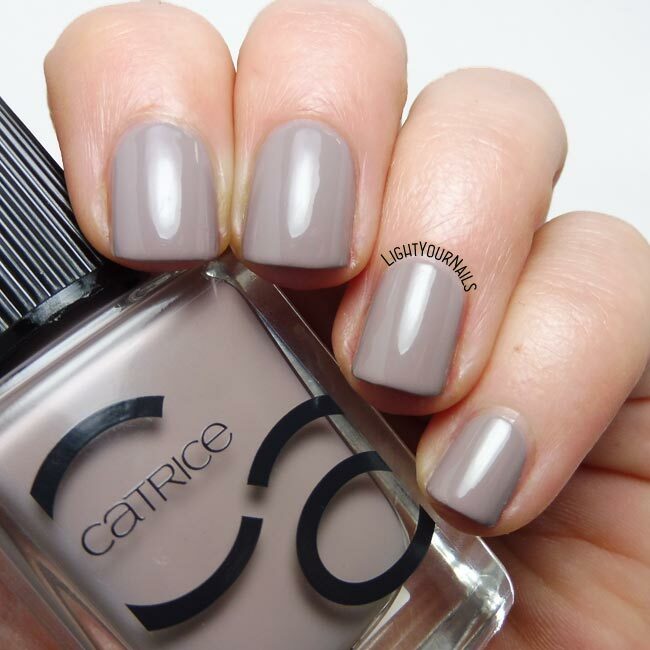 However if you have no favourites Catrice Lana del Grey might be a good purchase. Do you like it? And do you like taupe nails?